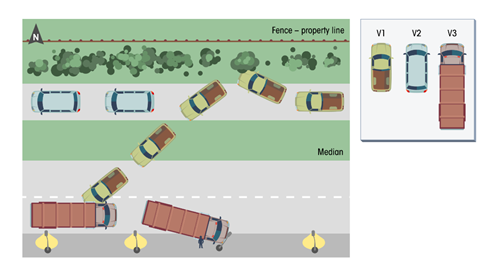 Generate a diagram to describe the crash. This space will be utilized to draw a diagram of the crash occurrence. 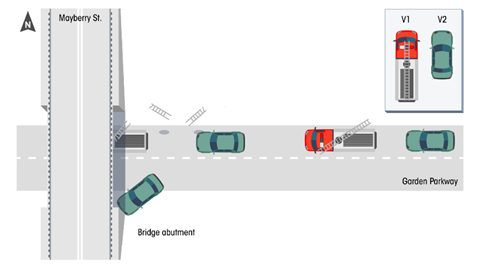 The maneuvers and paths of all motor vehicles, pedestrians and pedalcyclists are to be included in the diagram. An arrow indicating true north should be placed on the diagram or provided area. If the crash did not occur on a public way, it should be clearly marked if considered Off-Street Parking Lot, Garage, Mall/Shopping Center, or Other Private Way. A diagram relates occurrences and events spatially to each other and in relationship to the immediate surroundings. 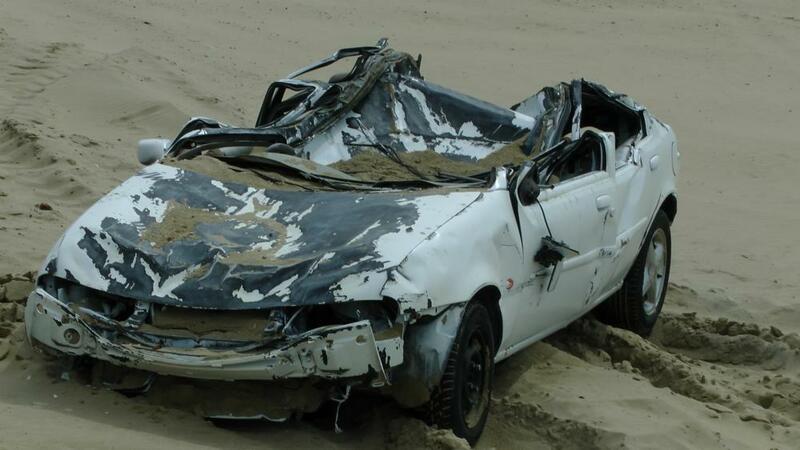 It provides a visual connection to some of the textual categories and descriptions provided in other parts of the crash report. Orient the north arrow so it is pointing to true north in relation to the roadways, and not just vertical. All involved vehicles should be numbered in such a manner that the vehicle numbers coincide with the vehicle numbers described in the narrative section and the motor vehicle information report. Pedestrians should be shown as a stick figure. Pedalcyclists should be shown as a bike symbol. All roadways must be labeled with a name or route number. House #’s, utility pole #’s and business names may be used in the diagram. Include traffic controls and crosswalks where appropriate. In the 2017 Crash Data Audit, the Crash Diagram was rated as adequate for 89 percent of reports reviewed. Additionally, approximately 87 percent of reports contained a north arrow. Auditors were unable to determine whether the existing north arrow was being used correctly. Other challenges included a missing Roadway name or a general lack of specificity. 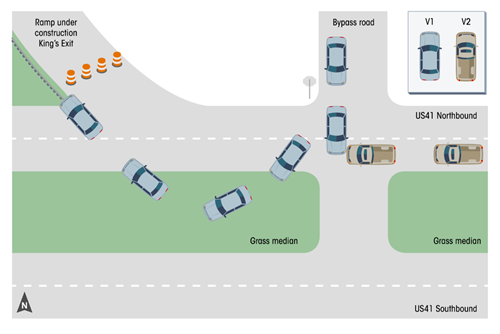 The crash diagram is a vital component to the crash report; it helps verify not only the location attributes, but also the series of events and resulting damage.